It's that time of the season again! 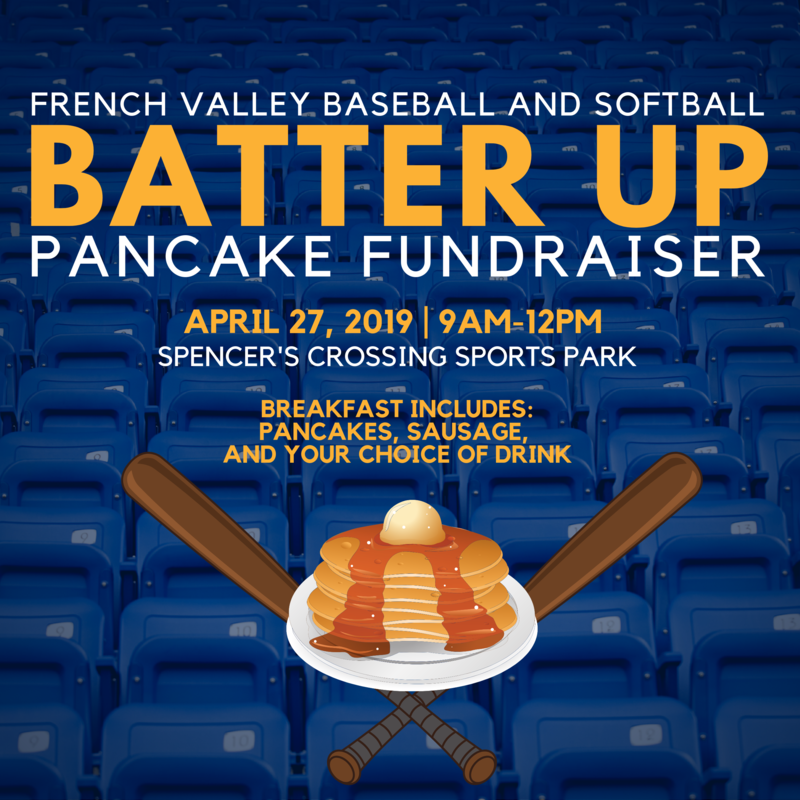 Your French Valley Baseball and Softball League Fundraiser. We are bringing back the Pancake Breakfast at Spencer's Crossing Sports Park on April 27th from 9am-12pm. Come out and enjoy a meal to remember with the whole family and kick off EOS with a hearty meal. Each meal comes with a Stack of Delicious Pancakes, Sausage, and your choice of Drink! Team Parents will distribute your Pancake Breakfast tickets starting Monday, April 22nd. 5 Fundraiser tickets were repurchased at registration for each Player that can be either used by your family or sold to recoup your cost. 1 - button for every player. Completely fill out the form on the website! Due to all the weather that is hopefully behind us, we have rescheduled games as much as we could. For Shetland, Pinto, and Mustang we have updated the system with all changes. The makeup schedules begins the week of Apr 9th. Please check your team schedule on our website for all changes. For the Bronco and Pony divisions, our interleague partners are coordinating the rescheduling efforts. Games scheduled may impact practice slots. Understand with the rescheduling of the games, we will be cutting through your practice slots. With only being able to meet a maximum three times per week as team, if you have a game reschedule, you will not practice that week if you have three games in a week.